Though it’s so tempting to cut into them right away, I recommend letting them cool overnight in the fridge. 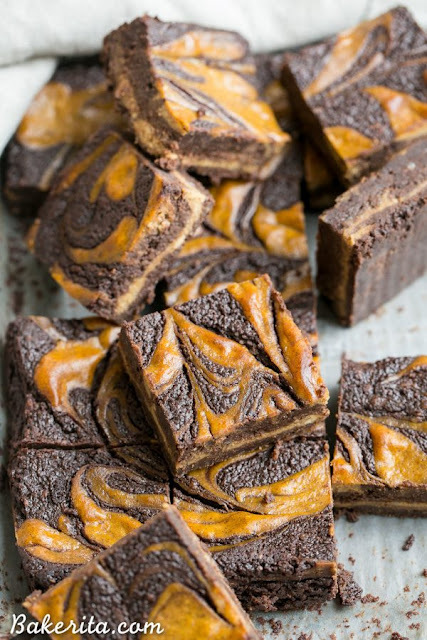 They condense into the most wonderful fudge-like brownies around, with that irresistible tangy pumpkin cheesecake layer. They’re so dense and rich, you’ll just need a small slice. A little bit goes a long way. Time to get your fall baking on – enjoy! Preheat oven to 325ºF. Line with parchment and lightly grease an 8x8” baking pan. To prepare the cheesecake swirl, combine all of the ingredients for the pumpkin cheesecake swirl in the bowl of a stand mixer and mix until completely combined, about 1-2 minutes. Set aside. Put the chocolate and coconut oil in a large glass bowl and microwave for 30 seconds. Stir, and repeat until the chocolate and coconut oil are completely melted and smooth. Add the coconut sugar. Whisk until completely combined. Let the mixture cool to warm room temperature. Add the almond flour, salt and cocoa powder. Using a rubber spatula, fold the dry ingredients into the chocolate until completely combined. Spread half of the batter in the bottom of the prepared pan. Bake in preheated oven for 28-32 minutes or until a toothpick comes out with moist crumbs attached. Don't over bake!